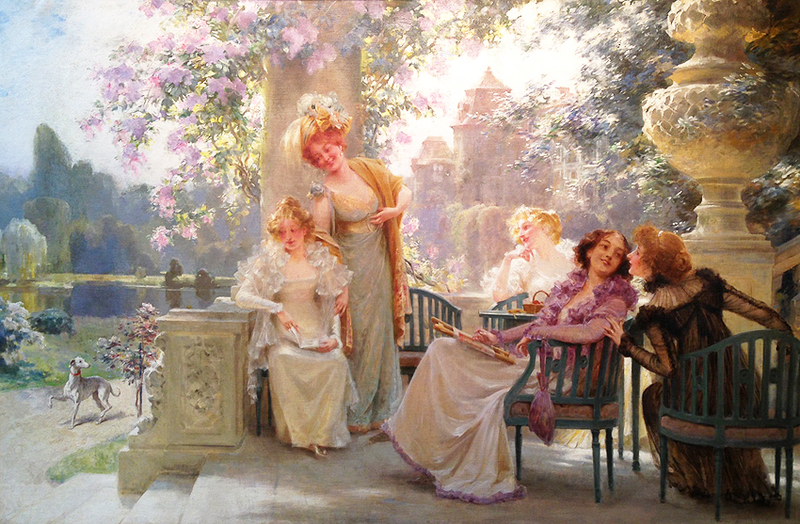 Alois Hans Schram (Austrian, 1864-1919) A Very Fine, Large and Impressive Oil on Canvas Titled "Springtime with Friends" depicting five young maidens relaxing and chatting in the rear atrium of their Villa, four seated and one standing, with a landscape scenery full of bloomed flowers, trees, a lake, a castle and an intruding dog, within an ornate gildwood carved frame. Circa: Vienna, 1890. This fine artwork is one of Schram's largest paintings, probably commissioned for a Villa in Austria. Alois Hans Schram (Austrian, 1864-1919) was born in Vienna on August 20, 1864. He was a prolific painter and sculptor of historical subjects, figures, nudes, portraits, scenes with figures, genre scenes, local scenes, interiors with figures, landscapes with figures, urban landscapes, waterscapes and seascapes. Schram studied at the Vienna Academy under Griepenker, J.M. Trenkwaldl and Hans Makart. 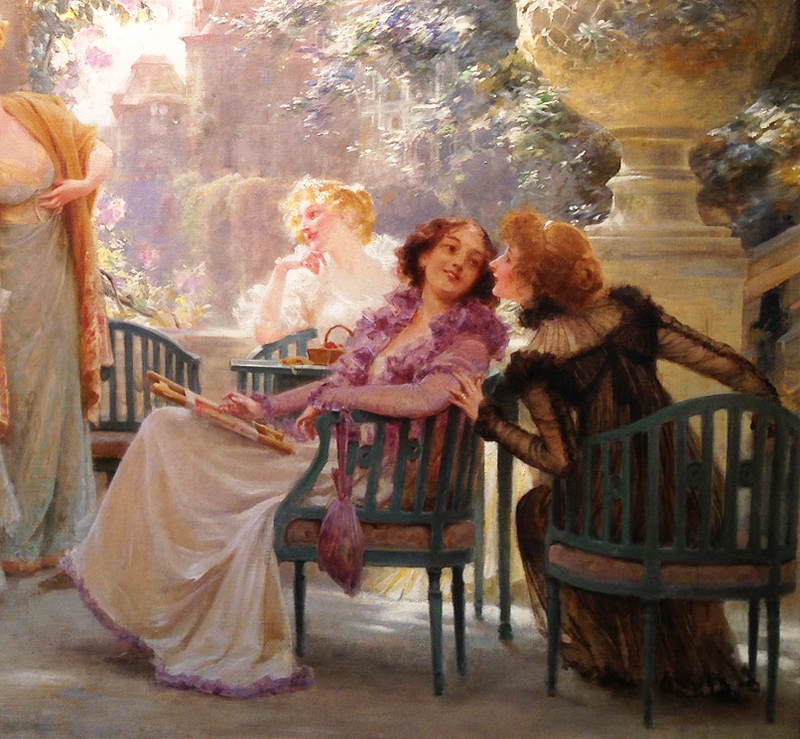 Many experts have compared his works to the likes of Albert Emile Artigue (1850-1927), Hans Zatzka 1859-1945), Rupert Bunny (1864–1947), Sydney Long (1871-1955), Ethel Carrick Fox (1872-1952) and Albert von Keller (1844 –1920). Schram received several awards and honorable mentions during his lifetime career. He won three State Prizes and a two-year scholarship to travel and study in Rome from 1889 to 1890. After completing his studies in Rome, he travelled to France (1893/1894), then to England, Spain, Sicily, Greece, Egypt and Syria. In 1891 he returned to Vienna again and in 1892 he received a second silver medal for his works. In 1902 he was awarded "The Carl Erzherzog Award and in 1908 he won the State Gold Medal . His artworks can be found in several museums and private collections around the world. In 1890 Schram became a member of the "Kuenstlerhaus" Artist Union in Vienna. 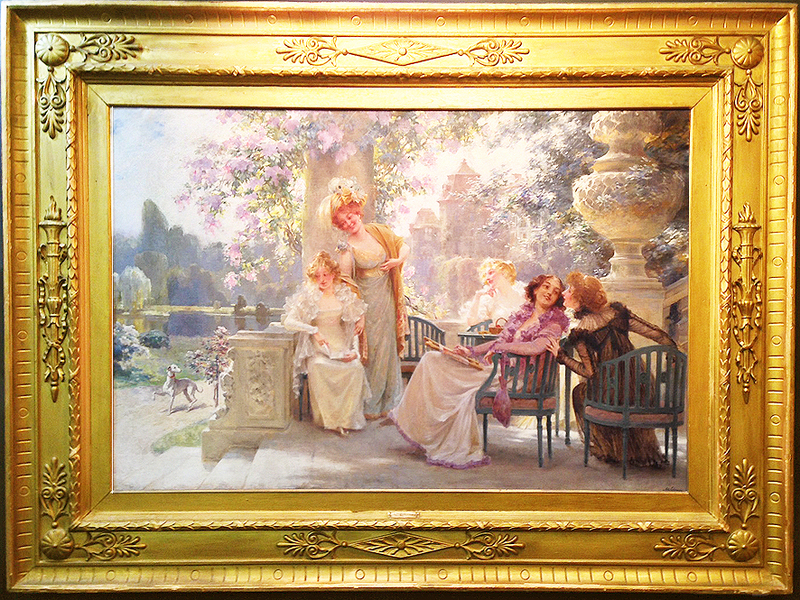 Alois Hans Schram (Austrian, 1864-1919) A Very Fine, Large and Impressive Oil on Canvas Titled "Springtime with Friends" depicting five young maidens relaxing and chatting in the rear atrium of their Villa, four seated and one standing, with a landscape scenery full of bloomed flowers, trees, a lake, a castle and an intruding dog, within an ornate gildwood carved frame. Circa: Vienna, 1890. 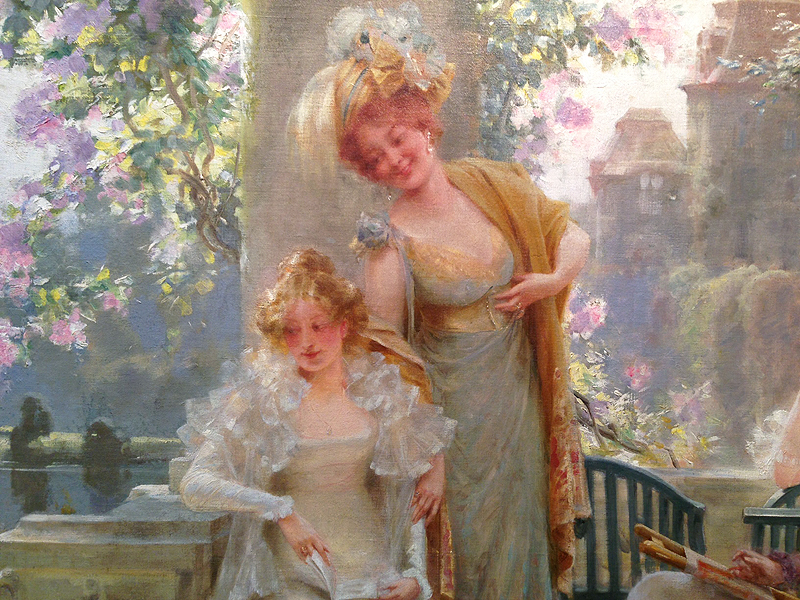 This fine artwork is one of Schram's largest paintings, probably commissioned for a Villa in Austria. Alois Hans Schram (Austrian, 1864-1919) was born in Vienna on August 20, 1864. He was a prolific painter and sculptor of historical subjects, figures, nudes, portraits, scenes with figures, genre scenes, local scenes, interiors with figures, landscapes with figures, urban landscapes, waterscapes and seascapes. Schram studied at the Vienna Academy under Griepenker, J.M. Trenkwaldl and Hans Makart. Many experts have compared his works to the likes of Albert Emile Artigue (1850-1927), Hans Zatzka 1859-1945), Rupert Bunny (1864–1947), Sydney Long (1871-1955), Ethel Carrick Fox (1872-1952) and Albert von Keller (1844 –1920). Schram received several awards and honorable mentions during his lifetime career. He won three State Prizes and a two-year scholarship to travel and study in Rome from 1889 to 1890. After completing his studies in Rome, he travelled to France (1893/1894), then to England, Spain, Sicily, Greece, Egypt and Syria. In 1891 he returned to Vienna again and in 1892 he received a second silver medal for his works. In 1902 he was awarded "The Carl Erzherzog Award and in 1908 he won the State Gold Medal . His artworks can be found in several museums and private collections around the world. In 1890 Schram became a member of the "Kuenstlerhaus" Artist Union in Vienna. Bénézit, vol 12, p 523.